Apparently, not all shabu-shabus are created equal. Usually, you’d suspect the secret is in the stock, that no matter what you put in that steaming pot will taste good. 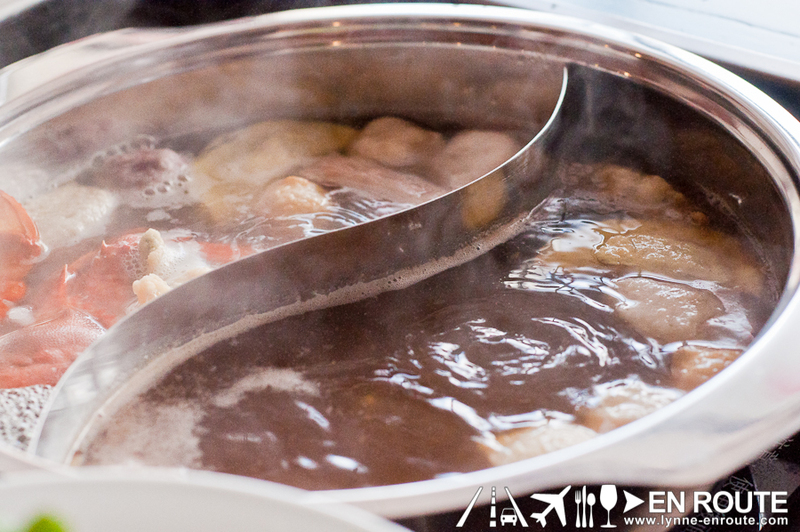 Enter Huat Pot Hot Pot, a new player in the hot pot scene. 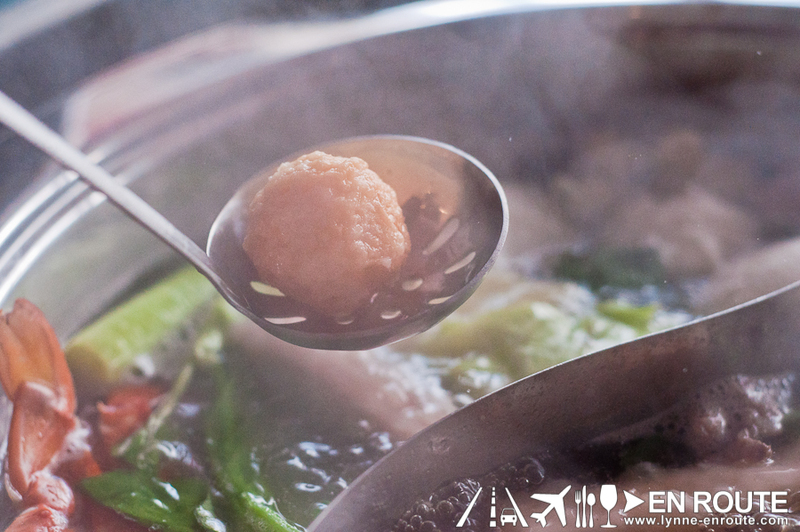 Shabu-shabu is commonly associated with Japanese restaurant, but what Huat Pot brings is a Taiwanese-style approach to this bubbling brew of meat, vegetables, and balls – lots and lots of them. Since we are no experts in hot pots, let’s follow their instructions. Choose up to two soup flavors. 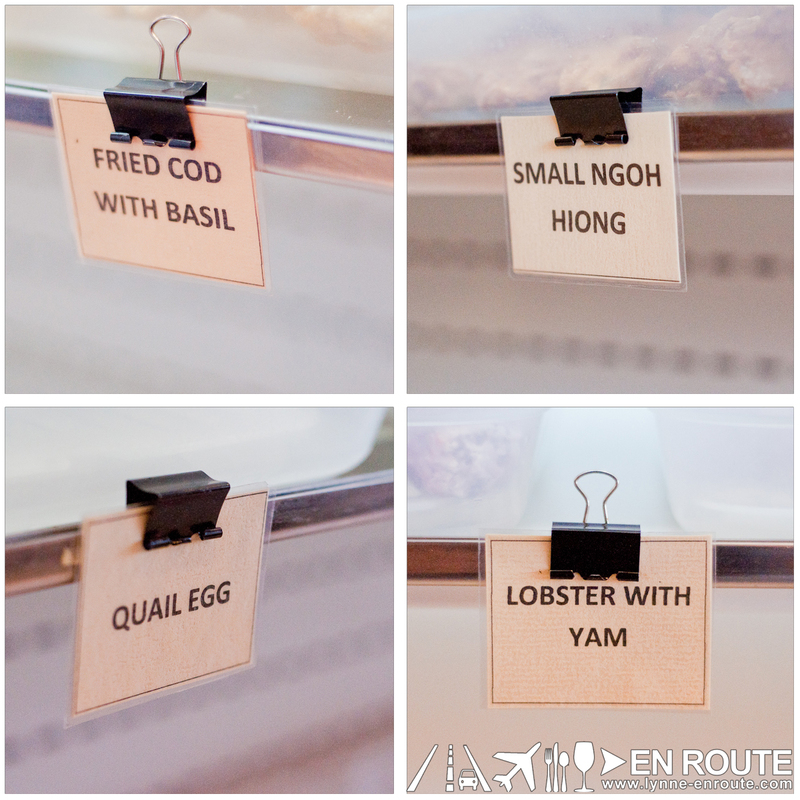 They have four broths to choose from: Huat Pot Special (Original), Sate (BBQ), Oden (Veggie lovers), and Mala (Spicy). 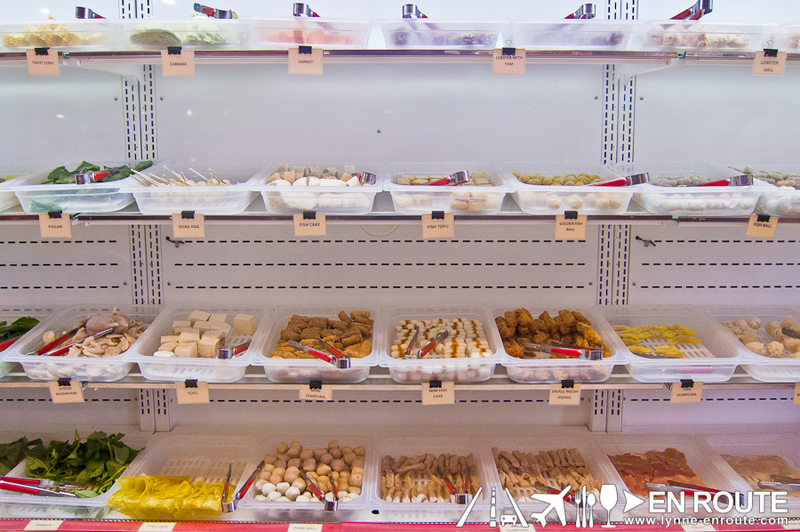 All of them are kept MSG-free so it’s really healthy and the flavor and quality of the ingredients shine through. With the help of Chef Jonas Ng, we chose the Huat Pot Special and the Sate because we wanted the house special and something sweet and spicy to combine or contrast with that. 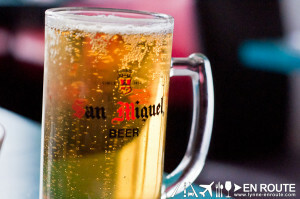 Huat Pot has unlimited beer, coffee, iced tea, soft drinks, and orange juice to choose from. 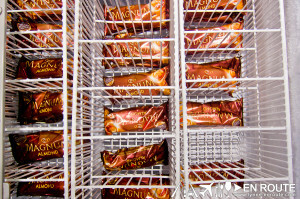 The dispensers and machines line the wall so all you need to do is just grab your fill. Waiters are on stand-by to assist customers too. Hot Pot dining, I realize, is a trifecta. It’s made up of the stock, the ingredients, and the dipping sauce. 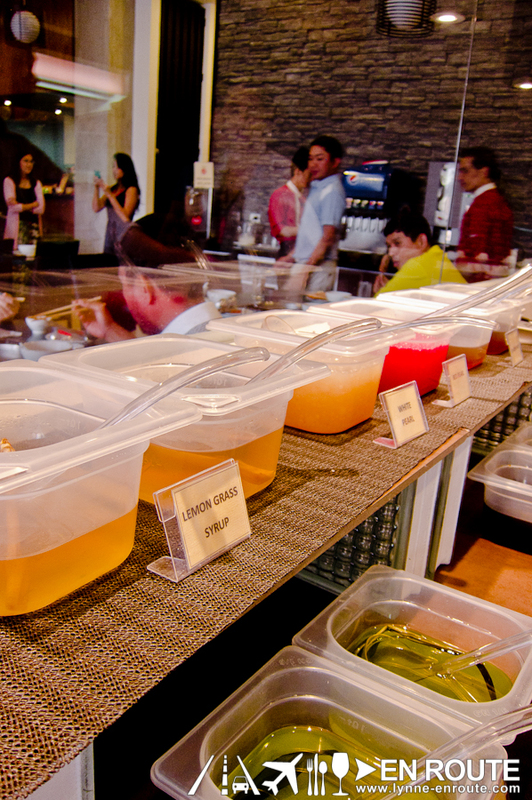 One thing Huat Pot does not lack is the amount of options to choose from so you can concoct your own sauce to your liking. 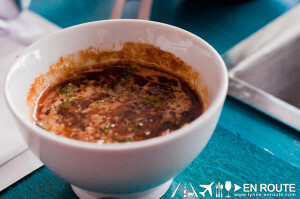 Trying to remember what Chef Jonas put together for us, it had a bit of light soy sauce, garlic, ginger, peanut paste, sate sauce, and coriander. In case we left anything out, I guess that’s the beauty of customizing it to your liking. Whether you go all out in the first run or make several trips, that’s completely up to you. Remember though, that your first additions to your broth will help flavor it the most. 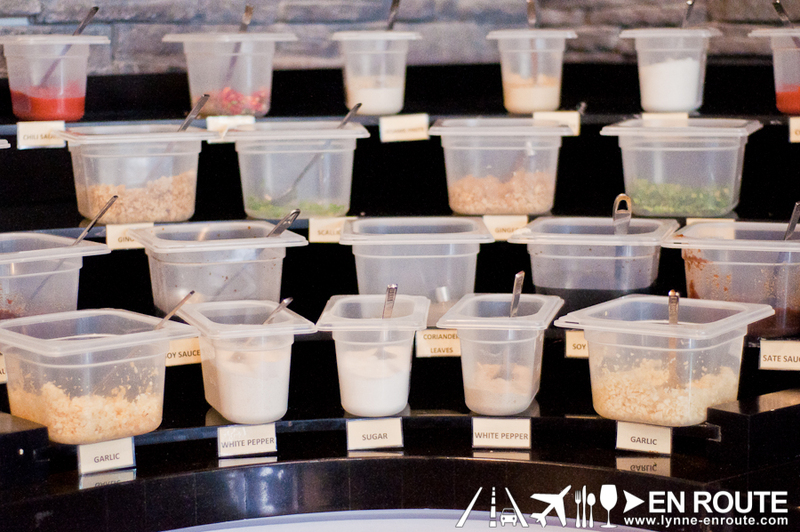 The choices of ingredients cover the length of an entire wall of the restaurant. 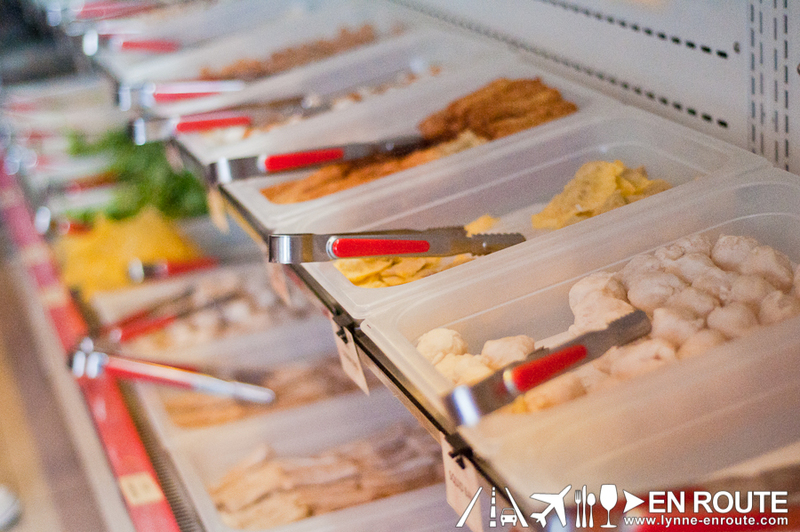 What they are very proud of also is that they maintain the high quality of the ingredients they get from Taiwan. They also try to bring in items that are not commonly found in your other hot pot restaurants. Two of our favorites were the Ngoh Hiong and Lobster Ball with Yam. 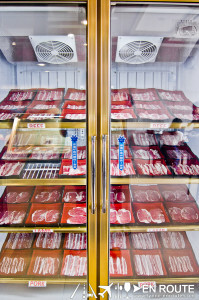 They also have a refrigerator full of thinly-cut beef, lamb, and pork. The lamb is sooo good! Wait for the soup to boil. Just a little more heat and your soup will be ready. It also ensures your ingredients are cooked through. Dump your ingredients into the stock. A good technique is to flavor both broths first. Good additions to any soup would be crab, corn, and some leafy greens like coriander. Your collection of balls from the wall can be dumped in also. Once the ball floats, you know it’s cooked through. 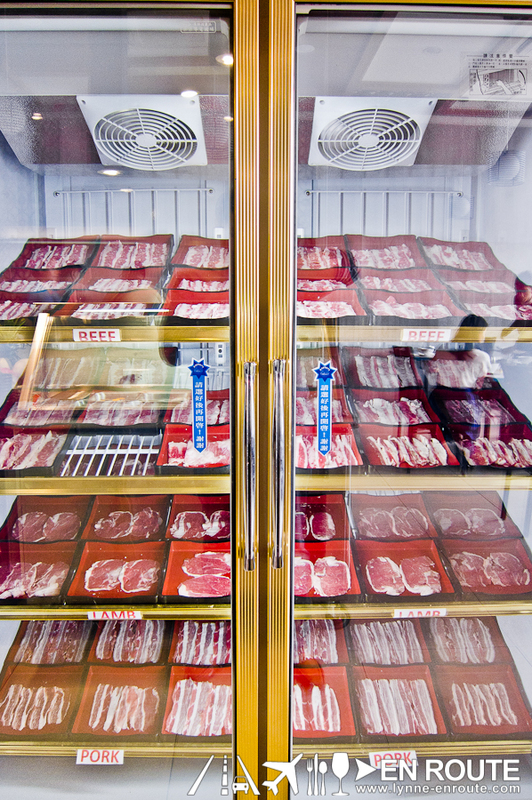 We suggest holding off on the meat until you actually want to eat it already. Given they’re very thin, they cook in seconds. Finally, it’s time to enjoy the healthy hot pot goodness. Get a piece from your pot, dunk it into your dipping sauce, and enjoy. As if all those choices weren’t enough. 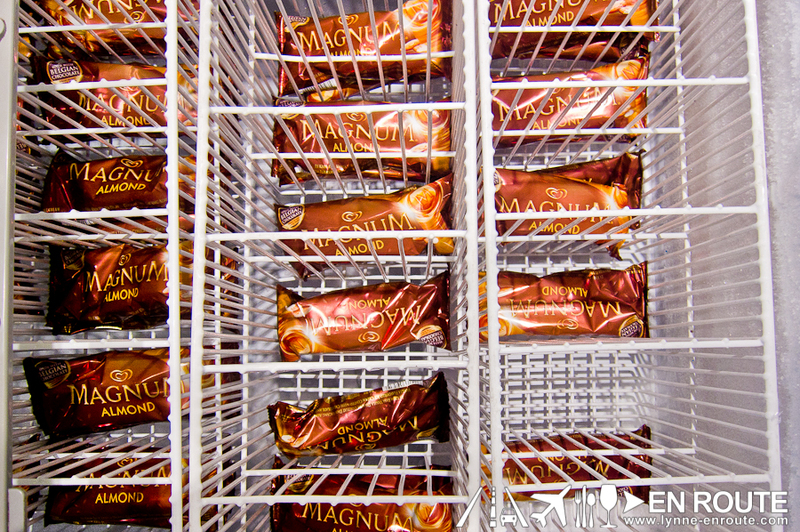 Whatever room you have left for dessert can be easily filled by the choices of fresh fruits, unlimited taho – complete with different syrups to choose from, and unlimited Magnum. 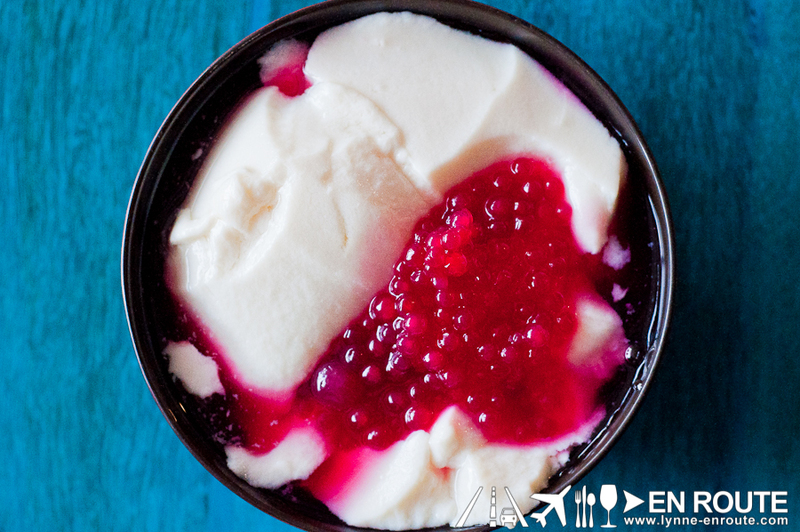 Since the hot pot meal is healthy, you can easily justify that dessert won’t hurt. Just like that, you can be hooked to come back again. There’s something in that bubbling cauldron of broth and that sauce you create yourself, not to mention watching and smelling as your food cooks right before you, that’s captivating and inviting. You really taste the quality and the uniqueness of the flavors. And let’s not forget that it’s healthy dining. What’s even better? 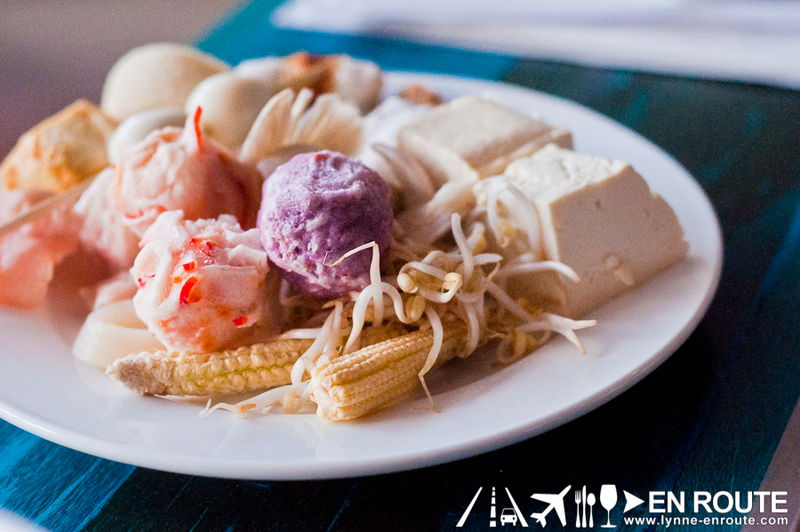 Everything is eat-all-you-can for the price of Php688++. That’s awesome value-for money you won’t get easily elsewhere. 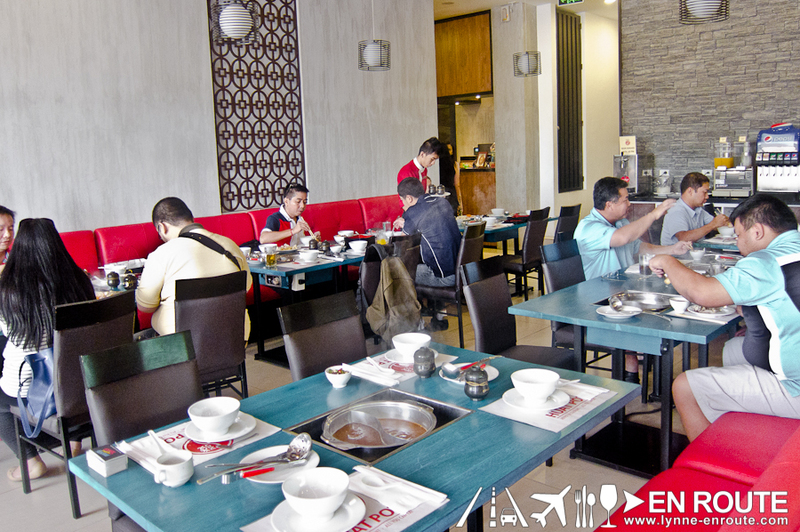 Huat Pot Greenhills is located at the 2nd Floor Metropoint Center, P. Guevarra cor. Wilson St. Greenhills, San Juan. For reservations and inquiries, you may get in touch with them through +632 650 3091 and +63915 480 5500.